Will heads roll? A line up of ministers and deputy ministers who failed to win new seats or retain their old seats for the ruling New Patriotic Party (NPP) has taught Ghanaians one important lesson — that 'big names' no longer matter in parliamentary elections. At press time on Thursday, the long list of top NPP casualties was growing even bigger. The line up includes Alhaji Ali Iddris Mustapha, Dr. Owusu Afriyie, Dr. Agambilla, Miss Elisabeth Ohene, Thomas Broni, Andrew Awuni, Professor Ameyaw Ekumfi, Owusu Yeboa, Ambrose Deri, Rasshid Bawa, Gloria Akuffo and Dr. Abdel Majeed Haroun. Dr. Kofi Konadu Apraku, Minister of Regional Integration and NEPAD was lucky to have escaped 'relegation', when he scrapped through with just 13,389 against 12,999 a difference of 390 votes. Out of the lot, the fall of Alhaji Mustapha, Minister for Works and Housing, was the most dramatic. As the incumbent MP, it was least expected that he would lose his Tamale South seat by such a wide margin (11, 729) to a political minnow like Haruna Iddrisu (38,296), a difference of 26,565. The same goes for Dr. Owusu Afriyie, Minister of Health. Though he was not a sitting MP, he was given the responsibility of bringing one of the Sefwi seats to the NPP. Against the background that the Sefwi people thanked the government for giving them a cabinet minister since independence, the people turned their backs on him when it mattered. Not many political analysts expected a miracle from Elizabeth Ohene, Minister for Higher Education and Kwesi Owusu Yeboa, Volta Regional Minister, who contested in a region commonly referred to as 'the world bank of the NDC'. Against all odds, Elizabeth Ohene polled an appreciable 3,000 votes, though it was nowhere near the eventual winner. Owusu Yeboa's Biakoye proved more of a nagging headache than analysts anticipated. Rashid Bawa could only blame himself. Having won the seat as an independent candidate, he needed no one to remind him that he was putting his seat on the line in a region where the NPP has no foundation. Equally fascinating was the team of deputy ministers the NPP fielded as parliamentary candidates. 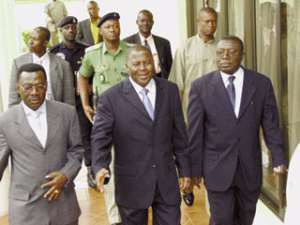 The use of Abrose Deri and Gloria Akuffo, Deputy Attorneys General, Andrews Awuni, Deputy Information Minister, Dr. Haroun Majeed, Deputy Minster of Mines, Dr. Agambilla, Deputy Minister of Railways and Ports and Thomas Broni, Deputy Minister of the Interior, was political strategy designed to win more seats from the NDC. But with the exception of Asamoah Boateng, a Deputy Minister of Information, who won his Mfatsiman West seat, the rest failed to deliver.